The opening of a new pathway is to create the first traffic-free link between two Argyll communities. 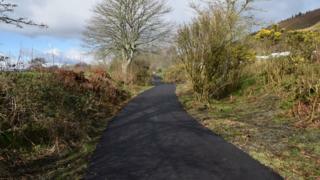 The completed section of the Caledonia Way at Ledaig will link the Benderloch and North Connel communities. The opening of the pathway - for walkers, cyclists and others looking for a traffic-free route - is the first milestone of 50 UK-wide improvements to the National Cycle Network. Previously, the villages were connected only by a busy trunk road. The link is part of a £2m investment by the Scottish government in National Cycle Network Route 78 - known as the Caledonia Way - which passes through Argyll and Bute and the Highlands. The Caledonia Way is used for an estimated 2.5m cycling journeys and 3.9m pedestrian journeys per year. The 1.5km section being opened will provide young people from North Connel attending Lochnell Primary School in Benderloch with a safe route to walk or cycle to school. Image caption The completed section of the Caledonia Way at Ledaig will link the Benderloch and North Connel communities. Local school pupils Kai and Finn said: "It will definitely encourage us to cycle to school more frequently." William added: "Children can take bikes, old people can now use mobility scooters and parents with prams can have a lovely walk." Xavier Brice, Sustrans' chief executive, said: "The opening of this new link marks the start of delivering the vision we set out for the National Cycle Network: to create a network of traffic-free, safer and more accessible paths for everyone. "And this traffic-free path will do just that, from the way it will help boost tourism, bringing benefits for local businesses, to the way it will serve local communities connecting them to places, and to each other." Michael Matheson, cabinet secretary for transport, infrastructure and connectivity, said: "I am delighted the new section of National Cycle Network Route 78 at Ledaig is now ready for use. "It's an excellent example of the good work that is taking place across Scotland to provide safer and friendlier segregated walking and cycling paths in our towns and cities."